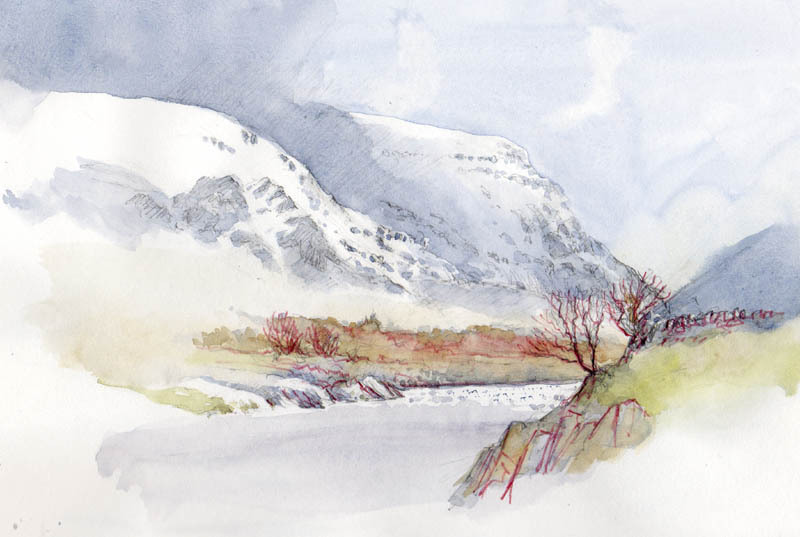 My recent silence is a result of being up in Snowdonia, at last finding some snow this winter to sketch and roll around in. At times ferocious winds made sketching something of a challenge, but I returned with several good compositions to work on. One subject I spotted while driving along first thing, and luckily there was somewhere to park. The scene that caught my eye was dominated by Esgair Felen – not perhaps an outstanding subject under normal conditions, but under deep snow and with the early morning light catching it, I just had to go for it. I usually prefer to photograph a superb subject before sketching it, but as I arrived in position the sunlight faded. Still, I took some shots then hurried back to the car. Halfway back along the 150 or so metres the sun came out again, tempting me back. But I wasn’t playing that game. Without moving, I focused the camera on the mountain despite the fact that I could only see the top two-thirds or so, and fired away, catching the glorious light on the critical part at the top. Then I realised that I’d caught a new composition – the foreground in the shots was made up of crags and rocks, making the scene look far more remote than in actuality. OK, I didn’t have the lake in the scene, but I had a second exciting composition to play with. By playing its little joke on me – albeit the pretty common one of making the subject disappear before my eyes, or losing its appeal – it had actually given me two compositions instead of one, so in future I must watch for this phenomenon more closely, as perhaps I’m missing out on many secondary scenes……. 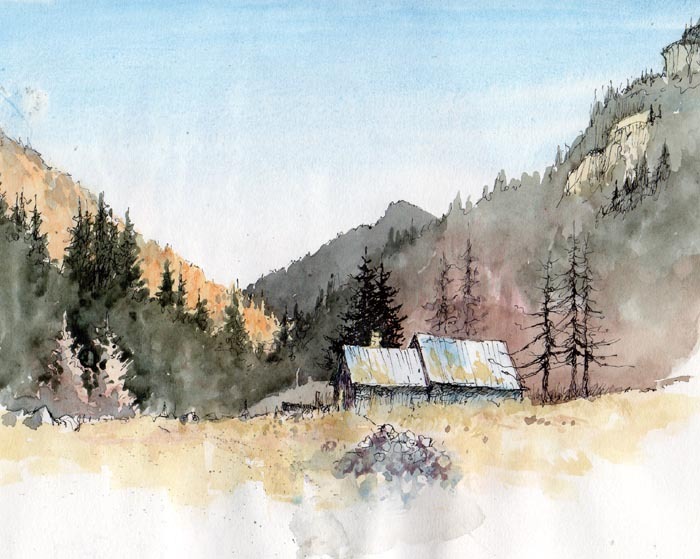 One of the most effective ways of sketching is by using pen and wash. I carry around hardback bound sketchbooks of cartridge paper amongst the many odd items in my rucsack, and these accept pen drawings well. While the dip-pen and bottle of ink are the ideal way, it is less practicable to carry around bottle of ink, so I normally resort to a technical pen, although this has a uniform line. This sketch was done in evening light in the Maritime Alps, on cartridge paper. I began with the ink drawing using a .02 nib. Where you have considerable depth in a scene, and especially with distant mountains, or wish to draw clouds, it is imperative not to be too heavy-handed with the pen on these distant elements. I prefer more intermittent line work rather than continuous lines as seen on the building, as this will suggest distance. In places I have totally omitted the line work and relied solely on the watercolour wash outline to describe the shape of far ridges and trees. The ink line is also an excellent way of rescuing a painting or watercolour sketch that is too weak in tones. My recent trip to the Alps was aimed at capturing snow scenes, but there was no snow until the final day when I had to leave. Somehow the snow appears to have been deliberately eluding me this winter! I hope all of you out there had a great festive season, or if Christmas isn’t your thing then you have been enjoying yourself. I seem to have been everywhere except by the laptop, hence the long silence. One place I did visit just before Christmas was sunny Devon, but as I found it gloomy and misty I decided to make the most of the atmosphere and capture some wet-into-wet mistiness. Whatever the weather is doing out there it always has something for the landscape painter. This watercolour sketch was carried out on a cartridge sketch-pad. 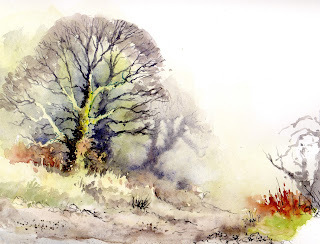 I chose this because firstly the smooth paper dries quicker than a rougher surface, which in the damp atmosphere would take some time to dry; and secondly I wanted to juxtapose the softness of the wet-in-wet technique with the hard sharpness that is accentuated on smooth paper. If you don’t like cartridge paper for quick washes try a hot pressed paper – Bockingford comes in ideal HP pads for this sort of work. First of all I laid on Naples yellow in the sky, then drifted it to the left where I blended in a light green wash where the two largest trees appear. Without pausing I painted the fainter tree in with ultramarine and burnt umber using a strong mixture to keep the shape of the tree – working into the damp paper you really don’t want much water on the brush! Again without pausing I then drew into the green wash with an indigo watercolour pencil while the wash was still damp. I sat back and drank a coffee while the sketch dried and then I laid a medium tone around the trunks of the tall trees, thus highlighting them. Note also how I have left the vegetation under the trees sharp-edged to counter the soft, misty background – much easier to achieve on a smooth surface. It’s only a rough sketch but it gave me great enjoyment and brightened up an otherwise gloomy day. If you need cheering up then why not tune in to CBEEBIES on BBC Television on Saturday 9th January at 10.45am and 15.40 – Catherine, my daughter is doing some of her whacky stunts. She is out in Australia at the moment and next month will be performing in Adelaide. A very Happy New Year to you all and may it be your best painting year yet! Artists who work solely from photographs really do miss out on those marvellous energizing sensations of being tossed around in the wind, or being spattered in face and sketchbook by rain, snow, hail, or whatever. These sensations link you with the natural world, and provide a tremendous advantage when you wish to really make your paintings more dynamic and full of movement. But, of course, not everyone wishes to go through such experiences. 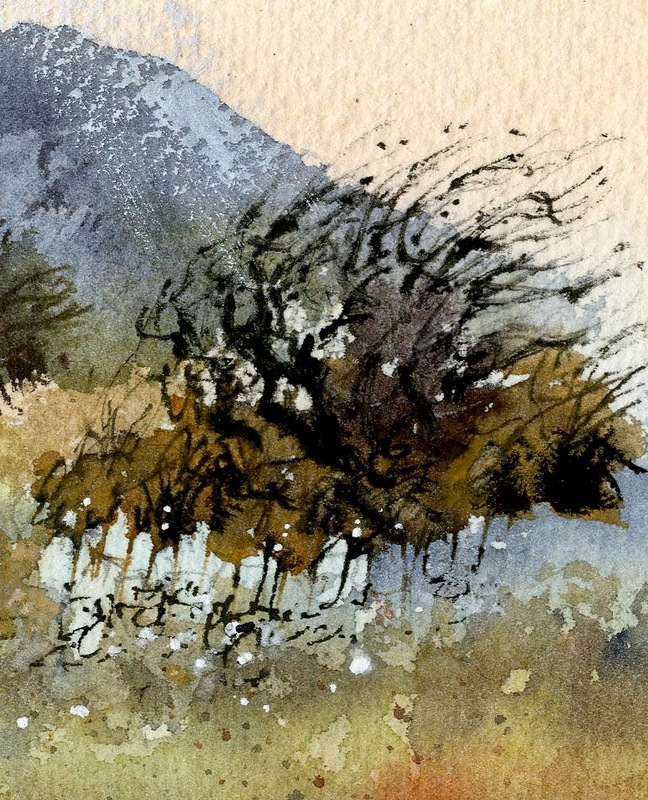 This section of drystone wall and wind-swept bush is part of a watercolour painting where I began with masking fluid painted over where the stonework would appear. The dark bush throws up a strong tonal contrast with the top of the wall, and after this had dried I removed the masking fluid and brushed a light blue-grey wash over the right-hand end of the wall to subdue that part. For the branches I mixed some burnt umber and French ultramarine and applied it with a number 1 rigger. To give a sense of strong wind and movement I painted with vigorous strokes outwards from the centre of the bush. When this was done I spattered a number of small blobs or spots with the same mixture, to further enhance the feeling of robust movement in the branches. With all the branches bent in the same direction it suggests a rather windy day. Watch for these effects when you are out and about, and note them, even if you don’t have a sketchbook or camera with you. You can, of course, include them in a composition where there is no wind, just to liven things up a but, or to create a sense of movement. This can be really effective on water – I’ve just returned from a few days in London and when sketching on the Thames the water was alive in the wind, creating a real sense of sparkling movement in the sunshine. Have a go at this more vigorous approach – it really does give your work a marvellous boost. As we pass from autumn into winter it’s a time of year when many artists seem to go into hibernation, especially if there are no local art classes to encourage them. When I wrote my latest book Winter Landscapes in Watercolour my aim was to encourage people to take a serious look at the countryside in winter, and if possible to get out and record the scenes in sketches or with a camera. The winter landscape can be breath-takingly beautiful, a time of year when you can find some of the most dramatic and often simple compositions that almost beg to be painted. So how do you make the most of this exciting time of year? If you keep an eye on the weather forecast you might get some idea of what’s to come, but they seem to get it so wrong so often that it pays to be prepared for those glorious days when conditions are just right, whether snow is on the ground or not. If it takes you an hour or more to get your art gear together then you may well have lost the best part of the day, so having all your kit ready for action is vital. As far as keeping warm and dry is concerned, you can see in the photo that I am wrapped up in a warm fleece jacket, a warm sheepskin hat, scarf and thin gloves in which I can sketch quite happily. 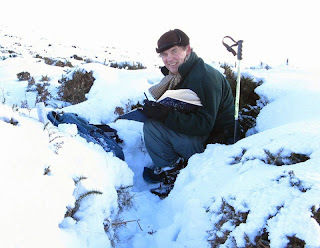 My trousers are lined, I have woollen socks and boots, thermal vest and inside the rucsack is my waterproof outer gear, a long neck tube which can cover not just my neck but up over my head as well, if need be, a steel thermos flask, mug, etc, so that I can make soup, coffee, tea, cappuccinos, the lot. I’m there to enjoy myself, so why not? My sketching gear varies from time to time, but in less-than perfect conditions it’s best to keep it really simple so that you can work speedily. I mainly sketch on hardback cartridge books, even in watercolour, as it dries quickly on the smooth paper unless conditions are truly damp. I take several soft-grade pencils along, including water-soluble ones which can suggest a lovely mood. They are especially effective for suggesting snow conditions. A range of four or five brushes is adequate, and often I use just one on a sketch. I also carry around a plastic aquash brush which holds its own water reservoir in the handle. You only need a few colours. I prefer half-pans when working out of doors, rather than tubes, as they are all ready for action once I open the box, which has its own integral palette. Finally, it’s also a great idea to have some plan of where you intend to go. I like to plan for different locations for different conditions. If the heavy rain has stopped, seeking out waterfalls in spate might be worthwhile. Hoar frost on trees may not settle for long, so in that case it would be vital to be out quickly into the trees. Snow can totally transform all kinds of landscape, which can give you a wide choice, but a thin covering can quickly disappear, and it may be all you get all winter! One last tip: try to get a 20-minute walk in before you sketch and you’ll find you can cope much easier than if you just stumble out of the warm car to start sketching or painting. So, with winter upon us, now is the time to sort out all that gear and be ready for those good days. Don’t forget, afterwards you can treat yourself to tea and cakes and really feel you’ve achieved something. Oh, and don’t forget that camera…..